CPO 3rd month Apr futures contract traded RM28 lower to close at RM2600 levels as compare to previous trading sessions with a total of 4,721 lots traded in the market. CPO price mainly consolidate during trading sessions but close lower on closing as crude oil and soybean oil electronic trading were traded weak during trading sessions. CPO price seems fail to penetrate resistance levels at RM2626 regions, 261.8%, 61.8% and 161.8% Fibonacci resistance levels after attempt to rebound until RM2617 regions, 50% Fibonacci resistance levels. Technically, CPO price seems trading lower after reached top at RM2626 region despite we anticipate around RM2655 regions; 78.6% Fibonacci resistance levels. CPO price seem break down from head and shoulder formation in the hourly price chart formation where we anticipate next nearest support seen at RM2575 and RM2545 regions. However, CPO price would view trading on medium term uptrend provided support levels were not violated in the coming trading sessions. Resistance levels were seen at RM2655 and RM2726 regions. FKLI Feb Futures contract traded 3.5 points lower to close at 1254.5 levels as compare to previous trading session to with a total of 2,903 lots traded in the market. FKLI traded lower during trading session despite Dow Jones were traded higher during overnight trading while regional indices were traded mix during trading sessions. FKLI traded lower within downtrend channel in the hourly price chart while manage to hold above 61.8% Fibonacci support levels at 1251 regions. Technically, FKLI would expect further traded lower provided support levels at 1248 and 1244.5 were not hold up against the selling pressure during trading sessions. 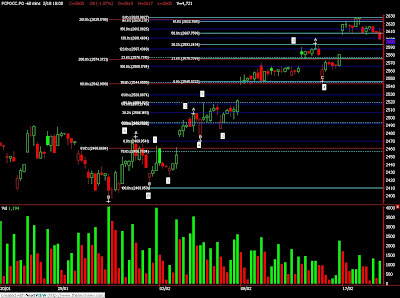 However, FKLI resistance levels still seen at 1266 and 1279 regions, both were 61.8% and 78.6% Fibonacci resistance levels. FCPO May Futures contract traded RM48 higher as compare to previous trading sessions to close at RM2628 with a total of 6,409 lots traded in the market. FCPO was opened and traded higher during trading sessions as soybean oil and crude oil were trade higher during overnight trading despite export figure show weakness on demand as compare last month data on the same period. FCPO price manage to penetrate resistance levels at RM2600 regions; 61.8% Fibonacci resistance levels after manage to found support at RM2546 and RM2562 regions in the hourly price chart. Technically, FCPO price would expect greater selling pressure around resistance levels at RM2655 and RM2726; both 78.6% and 100% Fibonacci resistance levels while projection at 300% and 61.8% Fibonacci levels. However, nearest support seen at RM2606 and RM2562 must be penetrated in order for CPO to reverse towards downtrend in the coming trading sessions. FKLI February Futures contract was traded 13.5 points higher as compare to previous trading session to settle at 1258 levels with a total of 4,126 lots traded in the market. FKLI opened and traded higher during trading sessions as Dow Jones was traded very encouraging while regional indices were traded higher during trading hours. FKLI manage to penetrate previous resistance levels at 1257.5; 50% Fibonacci resistance levels range from 1295.5 to 1219.5 levels. Technically, FKLI currently affirm riding on rebound wave provided critical resistance level at 1295.5 was not violated while nearest resistance levels seen at 1266.5 and 1279.5 regions. RSI in the hourly price chart show minor bear divergence while Price Oscillator and MACD yet to show any sign of bear divergence. This provided further confident that FKLI currently riding on rebound wave instead of bull market. 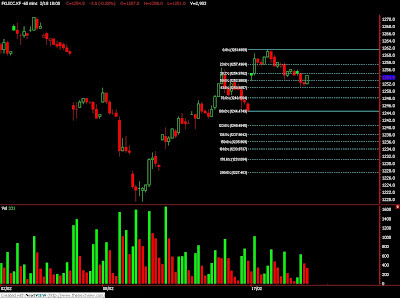 However, support levels at 1255 and 1244 regions must be violated in order for the downtrend to resume.